On the second anniversary of the Fukushima nuclear disaster in Japan, Cecile Pineda, anti-nuclear activist and critically acclaimed author, is touring the Great Lakes and will speak in Grand Rapids this Thursday. The author of Devil’s Tango: How I learned the Fukushima Step by Step, Cecile will give her stirring insight of the nuclear industry and update us on the consequences of the tragic event that began to unfold on March 11, 2011, with the meltdown of three reactors at the Fukushima Daiichi nuclear facility. 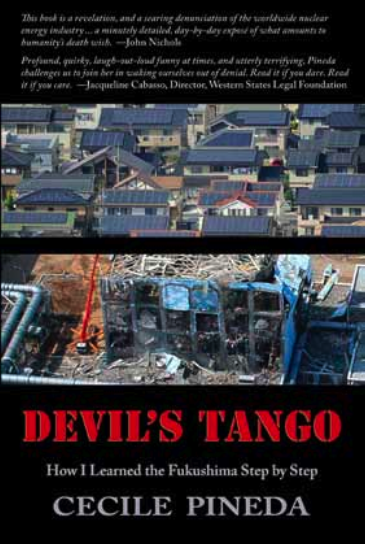 Devil’s Tango is an anguished dissection of the nuclear industry in which a crazy quilt of multiple voices, pieced together day-by-day, reflects Cecile’s attempt to come to terms with Fukushima’s catastrophic consequences to the planet. Co sponsored by: Kent County Women’s International League for Peace and Freedom, POLIS (Aquinas College Student group), Don’t Waste Michigan, Left Forum, Micah Center. For more info. contact smaki1@hotmail.com or (616) 897- 5107.